We met after work at Farragut Square and took the Orange Line to East Falls Church. After a pit stop at Dominion Wine and Beer to pick up some Cigar City Jai Alai IPA (no idea how Dominion got this stuff, Cigar City doesn’t distribute this far north) and Delirium Tremens, we walked to Pizzeria Orso. 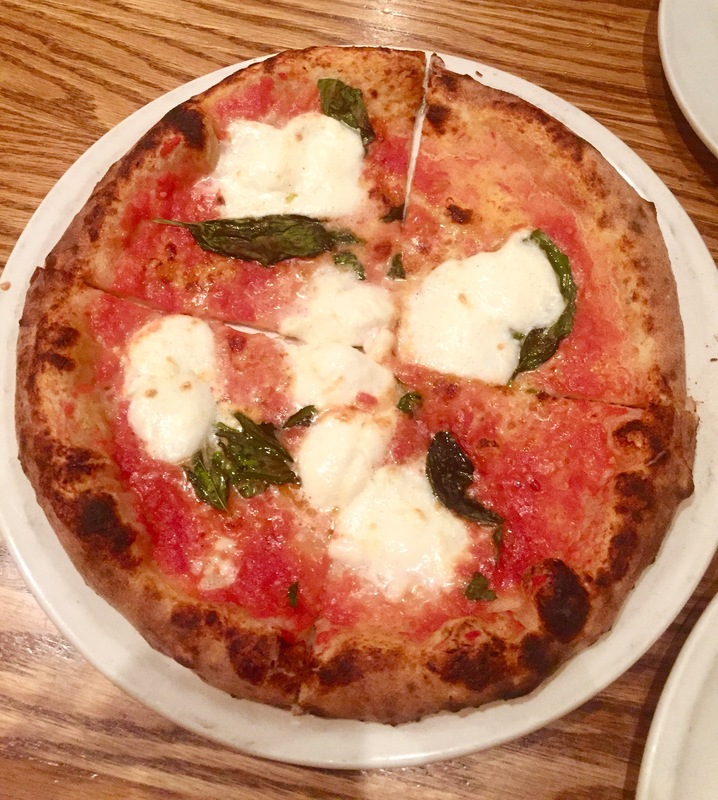 Pizzeria Orso is located in an office building in Falls Church City and it is one of our favorite Neapolitan pizzerias in the DC area. Pizzeria Orso was celebrating receiving its Verace Pizza Napoletana certification. Getting the certification is quite an ordeal. We started the meal with beers. Marnay had the Lost Rhino Faceplant IPA, from Ashburn, VA. It’s October and I had yet to have a pumpkin beer, so I got the Smuttynose Pumpkin Ale. 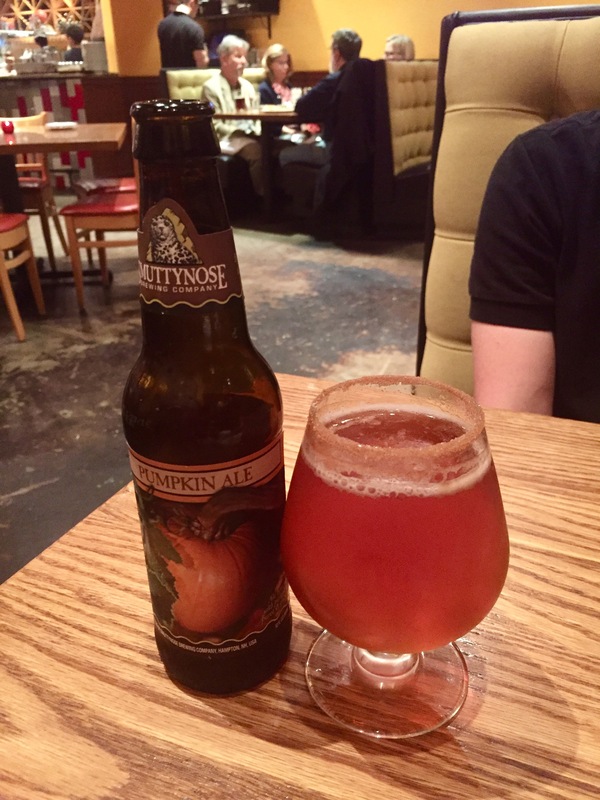 It’s brewed with actual pumpkin puree, which makes for a subtle flavor profile instead of an assault of spice and sweetness. The restaurant did put pumpkin spice on the rim of the glass and normally I would find that a little cheesy, but it was actually a fun touch based on the context of the meal. 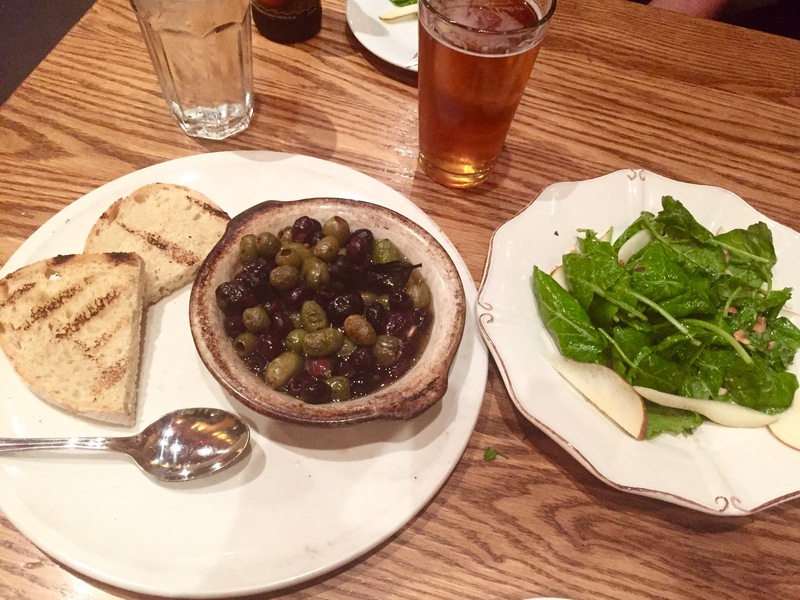 Next, we got oven roasted olives with extremely fresh homemade sourdough bread. The olives had been roasted in olive oil and it was fun to dip the bread in the oil, or to make little open-faced sandwiches. We also got a baby kale salad with pears, hazelnuts and white balsamic. The hazelnuts were our favorite part of this very simple salad, since we rarely see them. They brought a toasted flavor and a good crunch, but did not overpower the remaining ingredients. I think that as a general matter, the simpler the salad the better. As part of the celebration, the restaurant’s DOC Margherita pizzas were half off! DOC pizzas must be made of 00 flour, San Marzano tomatoes, buffalo mozzarella (made from water buffalo milk), natural yeast and salt. Absolutely nothing else. The dough must be mixed by hand, be no more than 11 inches and then be cooked for 60 to 90 seconds in a 900 degree wood or gas oven. At the end, basil and extra virgin olive oil are added. We have had lots of DOC certified pizzas over the last two years, but this was the richest, creamiest mozzarella we’d ever had. It made the pizza, in my opinion. The crust had just the right level of char and the middle was soft, as it should be. We had a great time at Pizzeria Orso. I can see us going after work quite often. We left early one Friday and took Amtrak to New Haven, CT. We were in town for my cousin Heather’s wedding. I had met some people on the MARC train who used to live in New Haven and who gave me some great ideas. I was told that Zinc was an excellent New American restaurant, so we made a reservation for our first night. 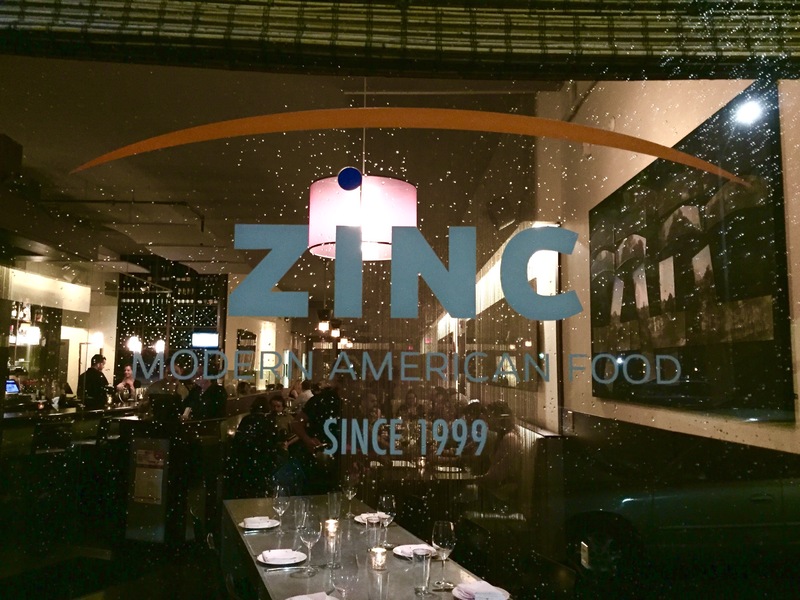 Zinc is a farm-to-table restaurant across from the historic New Haven Green. It has a cool, sophisticated vibe that you can feel immediately upon entering. We started the meal with drinks—I had a pear maple Old Fashioned with James E. Pepper ‘1776’ bourbon, spiced muddled pears and urban moonshine maple bitters. Marnay had a glass of Rioja—she is a big fan of Spanish reds. We were given homemade pita squares with red pepper ginger dipping sauce. The dipping sauce had a distinctive Thai flavor, with the addition of lime, chilies and (likely) fish sauce. 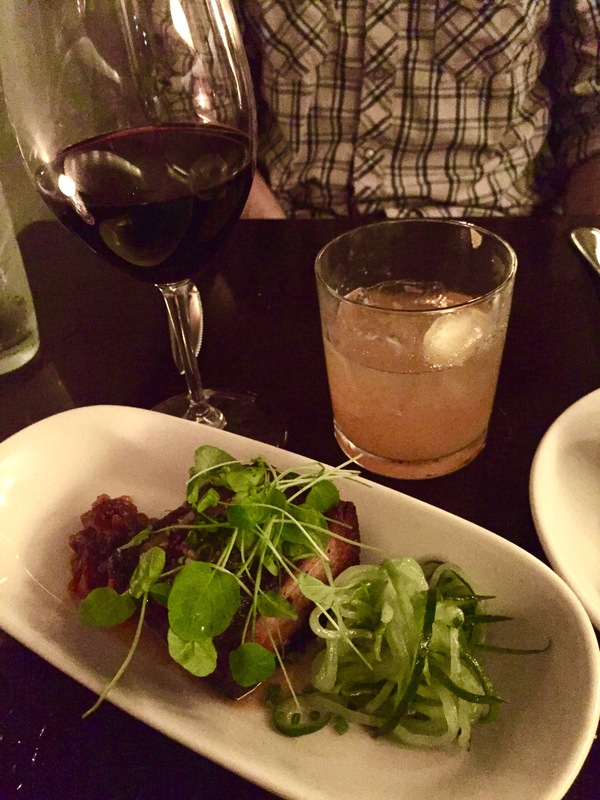 The best bite of the meal was the braised pork belly with cucumber noodle pickles, tomato jam and a Calabrian chile glaze. The pork belly was so tender it just fell apart as soon as the fork touched it. There was a nice kick from the Calabrian chile glaze as well as sweetness from the tomato jam. I think that our favorite part of the dish was the cool, crunchy cucumber noodle pickle because of the contrast with the warm, tender pork belly. For the main course, Marnay got a moist filet of pacific black cod with an absolutely perfect crispy skin, made even crispier with a wild rice crust. 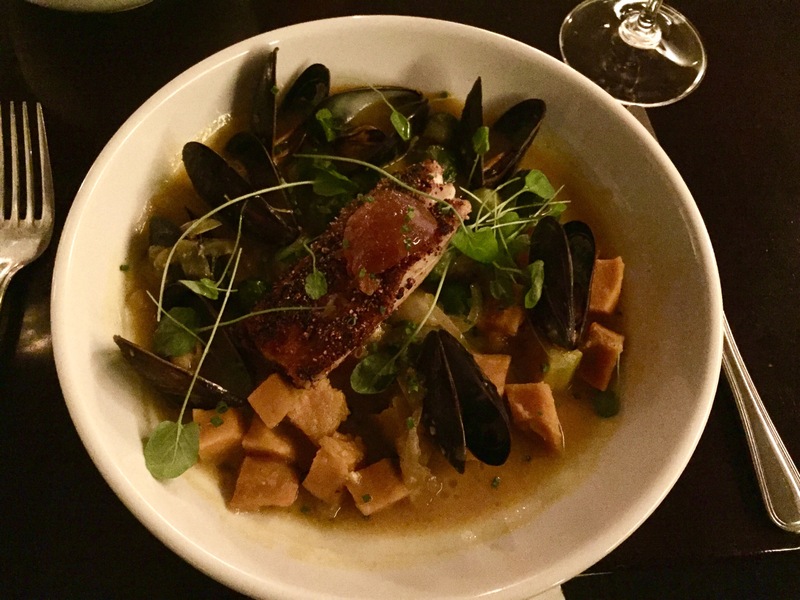 The cod was in a seasonally appropriate spiced squash broth with PEI mussels, caramelized Brussels sprouts and an IPA jam. The fish was far and away the best part of the dish. The mussels seemed like an afterthought and their addition made little sense but on the whole, it was an excellent dish. 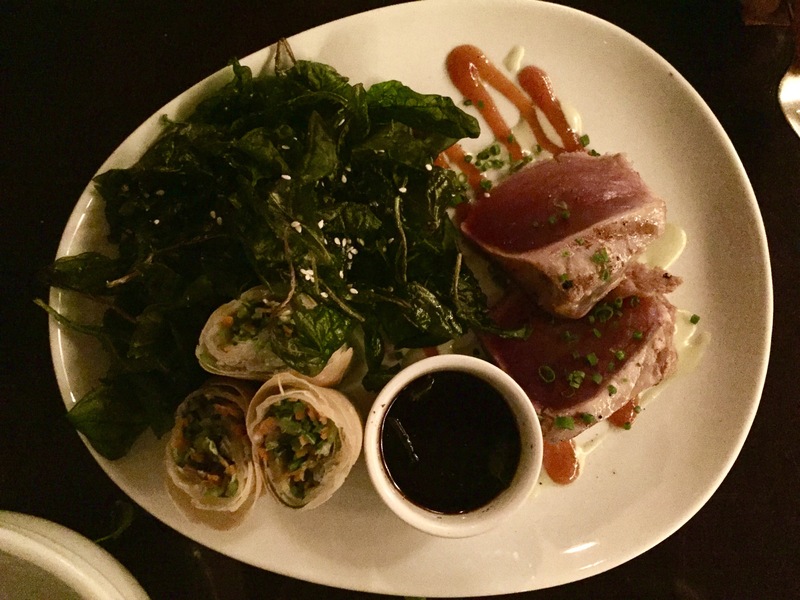 I had grilled Yellowfin tuna with a Tamari cure, vegetable spring rolls, fried spinach wasabi oil and a chile-garlic sauce. It was a beautiful piece of tuna and it was fun to swipe in the wasabi oil for a little kick. The fried spinach was nice, but the addition of the spring rolls was baffling. Simply too much going on, and a piece of fish that good deserves to be front and center! We had a lovely evening at Zinc with some delicious, high quality food and outstanding service.